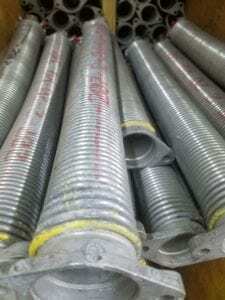 Home » Blog » Are Garage Door Springs Dangerous? Yes. Garage door springs can be dangerous. The danger lies in what happens if and when the springs suddenly fail. Since the spring is under constant tension, a sudden failure can cause the spring to break apart violently. Without the right safety measures in place, a sudden spring failure can cause serious injuries to anyone standing nearby as well as damage personal property stored inside your garage. Why Are Garage Door Springs Dangerous? Garage door springs play an important role when it comes to opening and closing your garage door. However, they can be the most dangerous part of your garage door and for a good reason. It’s all too common for homeowners to get injured by failing garage door springs, whether they’re attempting to replace them or if they happen to be in the wrong place when they suddenly fail. There are two types of garage door springs — torsion springs and extension springs. Both types heavily rely on tension to work. As your garage door closes, the force exerted on the spring through the garage door cables wind the spring. This stored energy is eventually released as the spring unwinds when the door is opened. This makes it easier to open your garage door, especially considering some garage doors can weigh 200 pounds or more. Fatigue is the most common reason for garage door spring failure. Most springs were designed to last for 10,000 cycles — approximately 7 years if you use your garage door 4 times a day. Throughout its lifetime, the constant winding and unwinding places stress on the metal spring, making a catastrophic failure more likely once it reaches the end of its working life. Rust and corrosion are another common reason for spring failure. Rust deposits can form due to lack of maintenance and upkeep. These deposits can weaken the metal, resulting in sudden failure if the spring isn’t replaced in time. Have a professional inspect and replace your springs – Garage door springs are at their most dangerous when they’re near the end of their working life. Have a trusted professional check the springs and replace them if necessary. Check the garage door cables – Make sure the steel cables running on both sides of the garage door are free of excess wear, fraying, and rust. Squeaky springs should get the grease – Ordinary wear and tear can cause garage door springs to make noise as they age. Proper lubrication not only silences your springs, but it also protects them against rust formation. Make sure the safety cables are present – You should always have a metal safety cable running through the garage door spring and anchored to the wall or ceiling at each end. The safety cable prevents the spring from flying apart if it breaks. These tips can help reduce the likelihood of sudden garage door spring failure, keeping you and others that use your garage out of harm’s way. Contact us if you need assistance with your garage door springs.